Editor's note: September 3 marks the fiftieth anniversary of the signing of the Wilderness Act. To commemorate the anniversary, we asked a small group of Island Press authors to reflect on the influence of this law to date and how its role may or should change as we move into an uncertain future. We'll be sharing these posts over the next two weeks. Fifty years ago, Congress created the Wilderness Act, which today protects nearly 110 million acres of United States lands. Protected, intact wilderness matters even more today than it did in 1964, when this act was signed. I am intimately acquainted with wilderness. For the past 20 years I have lived with my family in a cabin adjacent to the Bob Marshall Wilderness, at 1 million acres one of the largest federal wilderness areas in the contiguous United States. As a working scientist, my research on wolves (Canis lupus), elk (Cervus elaphus), aspen (Populus tremuloides), and fire in Rocky Mountain ecosystems has shown me that wilderness—which contains relatively intact, large tracts of land—is essential to create ecologically resilient landscapes. Carnivores are a big part of what makes these landscapes so healthy. Studies worldwide compellingly demonstrate that large carnivores enrich ecosystems by controlling their plant-eating prey, which in turn reduces herbivore damage to plants. However, large carnivores, such as grizzly bears (Ursus arctos) which need lots of room to roam and are vulnerable to conflicts with humans, need protected wilderness in order to thrive. My back yard provides a powerful example of the connection between carnivores and wilderness. The Bob Marshall Wilderness lies in the heart of The Crown of the Continent Ecosystem. The most important wildlife corridor in North America, this 28-million-acre ecosystem consists of 90 percent federally-protected wilderness. Seventeen species of carnivores live there—all the species present at the time of the Lewis and Clark Expedition in 1804. But looking beyond my back yard and the Crown of the Continent, federal wilderness matters to carnivores on a continental scale. 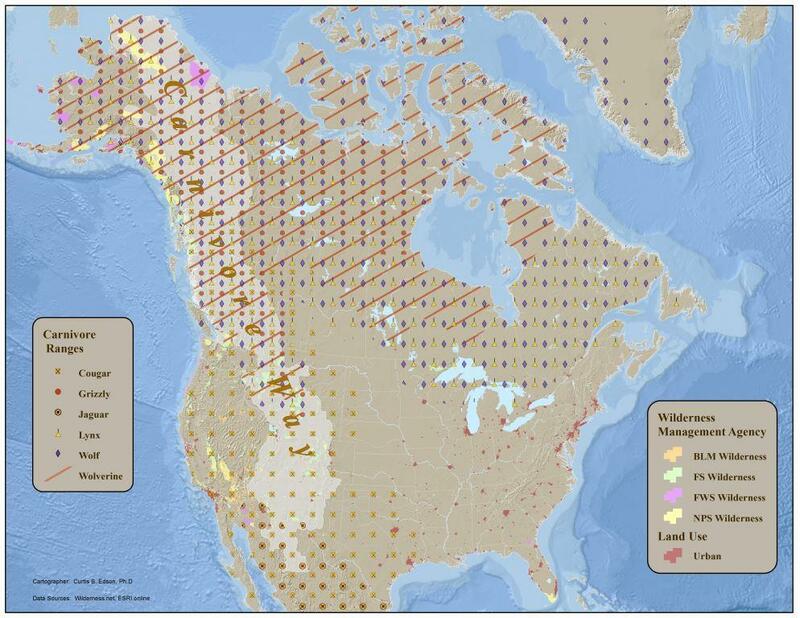 Carnivore distribution, federal wilderness, and urban areas. Map by Curtis Edson, used with permission. Click to enlarge. When I wrote the book The Carnivore Way, I enlisted the help of landscape ecologist Curtis Edson. He created beautiful maps of the distribution of each of the carnivores that I wrote about: wolf, grizzly bear, wolverine (Gulo gulo), lynx (Lynx canadensis), cougar (Puma concolor), and jaguar (Panthera onca). Curtis also created a composite map that contained the North American ranges of all of these species, overlain by urban and federal wilderness map layers. His composite map tells a riveting tale about the importance of wilderness. The layers show that where the carnivores are is where federally protected wilderness provides a refuge for them. As we move into the brave new world of climate change, the Wilderness Act’s legacy becomes increasingly vital. In today’s rapidly warming world, wilderness is essential to help large carnivores and other at-risk species, such as caribou (Rangifer tarandus), adjust to climate change. Wilderness gives them room to roam and find habitat that better meets their ecological needs. Therefore, as part of climate change adaptation, we should examine how our wilderness areas are distributed and identify areas where wilderness could be extended or added, to ensure corridors for migration and adaptation for the large carnivores and other species.